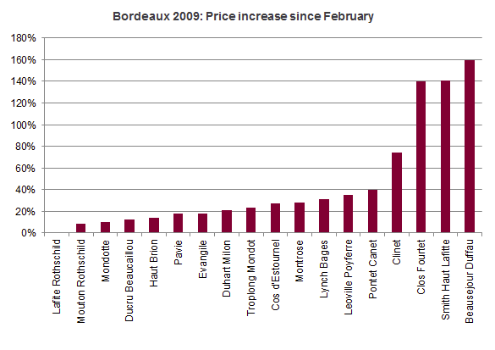 Trade on Liv-ex is being dominated by Bordeaux 2009, with 24 labels in particular monopolising interest. Of these 24, the majority – but not all – were those given 100 points by Robert Parker last week. The reaction to his scores was immediate and some fairly impressive rises were noted within 24 hours of the release. Now with a week to see the results in full, it is clear which wines have attracted the most interest and it is worth noting that the first growths and even certain super seconds have been left far behind by less fashionable names. The biggest riser was Beauséjour (Duffau Lagarrosse), which rose 160% according to the index. It was closely followed by Smith-Haut-Lafitte and Clos Fourtet on 140% and less closely by Clinet somewhere around 75%. Pontet Canet (40%), Léoville Poyferré (35%) and Montrose (28%) have also risen well and potentially have more room to appreciate further. Also of the 100-pointers, Ducru Beaucaillou and La Mondotte – with approximate rises of 10% and 8% respectively) are still priced at around £2,000+ a case and could climb further. 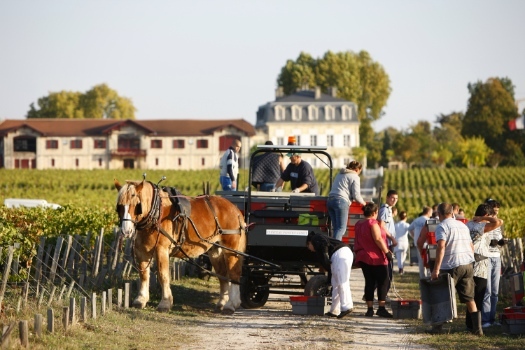 Others worthy of consideration in the 100 point group include Bellevue Mondotte and Pape Clement Blanc – the latter in particular still available for less than £1,000 a case but potentially stymied by a cruel lack of interest in white Bordeaux. It is also worth noting the presence of Troplong Mondot, Lynch Bages and Duhart Milon in the line-up below. Scored respectively at 99 points, 98 points and 97 points, they are well priced and have seen price increases of around 24%, 26% and 21% each. Troplong Mondot in particular is roughly the same score as Lafite and Mouton-Rothschild (99+ each) but has a best list price for 2009 of some £850 compared to £9,600 for Lafite and £6,340 for Mouton. However, Duhart-Milon too may have some way to go yet as it has yet to hit the highs of last year. Currently trading at £1,000 a case, last May it was at £1,250.